EDS is committed to providing our employees and our clients with a safe work environment. Our area of expertise takes us into workplaces that are literally above the norm, and we take many steps to ensure that we are in compliance with any and all regulations that are associated with the work we perform. 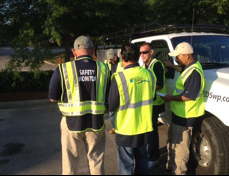 Education and hands-on training is the epicenter of our safety program. 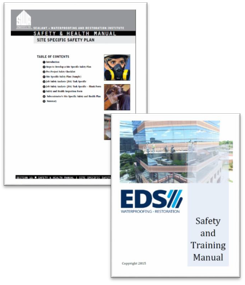 EDS has developed a comprehensive Safety and Training Manual which is administered by our in-house Safety Director. Our Safety Director conducts monthly in-house safety training classes to review safety protocol with our employees, as well as trains them to receive OSHA and SAIA certifications. EDS also draws upon industry expertise by utilizing guest presenters and attending courses offered by industry partners. When it comes to safety in the workplace, we consider our clients to be our partners. We share our industry-setting manual with building owners and property managers as well as training and JSA documentation deemed to be crucial as a guide to what we do and how we train our workers. Each employee shall be responsible for their own well-being, but all levels of the company take ownership of our safety program. Our management team performs a pre-work job hazard assessment, which is presented to all technicians at the Job Safety Analysis Briefing. This work plan briefing also informs employees of potential hazards, methods to eliminate those hazards, as well as developing a job specific safety checklist. Each employee also inspects their equipment and the jobsite. To maintain compliance, and coordination of our safety initiatives, we have a dedicated full-time Safety Director. In addition to teaching the safety classes administered in-house, our director performs daily jobsite inspections making certain that no hazards, faulty equipment, or possible infractions are present at jobsites. EDS personnel all know the importance of proper fall protection, all the time; from top level management down to our newest employee. Adequate fall protection is a matter of life and death; whether working at great heights or from a ladder. 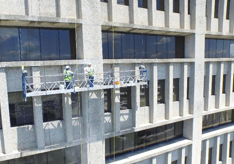 EDS employees comply 100% of the time with fall protection regulations. This gives our clients’ peace of mind and our employees a sense of security on every job. Training provisions supplement and clarify the requirements of 1926.21 regarding the hazards addressed.